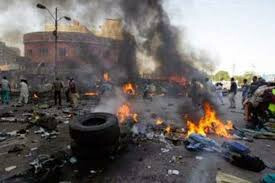 Three persons have been killed while 45 others have been injured in a twin bomb attack carried out by suspected Boko Haram members in Maiduguri, Borno state today April 7th. Confirming the incident to newsmen, the Head of the Rapid Response Team of the Borno State Emergency Management Agency, Bello Dambatta, said two members of the civilian joint task force confronted the carriers of the Person-Borne Improvised Explosive Device (PBIED) and tried to stop them, but they were killed alongside one civilian following the detonation. He stated that the injured sustained various degrees of injury as a result of the explosion and are currently receiving treatment at General Hospital Maiduguri. The two female bombers detonated their explosives at five minutes interval at Muna Dalti settlement.